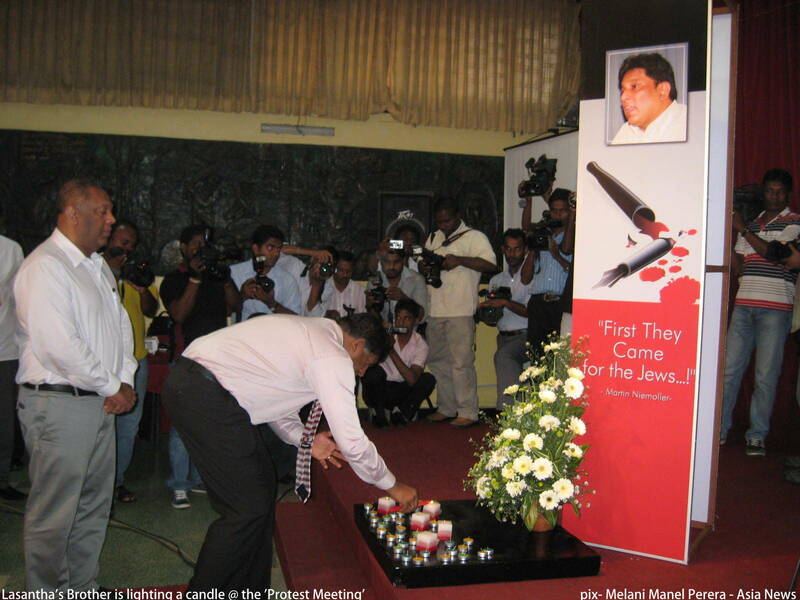 A rally is held to remember Lasantha Wickrematunga, assassinated on 8 January 2009. After three years, the police has not yet arrested the culprits. Human rights activists, civil society representatives and opposition politicians blame President Rajapaksa for the journalist’s death. Colombo (AsiaNews) – “With its actions, the government of Sri Lanka has shown that it has failed to protect democracy and human rights,” said Brito Fernando, co-convener of the Platform for Freedom (PFF), during a ceremony marking the third anniversary of the death of Lasantha Wickrematunga, a well known investigative journalist with the Sunday Leader, who was killed on 8 January 2009. Human rights activists, journalists, civil society representatives and opposition politicians came together to commemorate Lasantha Wickrematunga. His wife Sonali Wickrematunga took part in the event via Skype. Currently, she lives in the United States. Lasantha was killed at the wheel of his car by four gunmen on motorbikes. He had been a staunch critic of the civil war and had denounced the army for its human rights abuses. Aware of the risks he was taking, he had prepared his own obituary. Published a few days after his assassination, the article accused President Mahinda Rajapaksa for his death. “If they were able to capture Tamil Tiger leader Kumaran Pathmanadan abroad, how is it they can’t find Lasantha’s murderers,” he asks. “This regime should be held accountable for the violence inflicted on the population,” said Nimalka Fernando, of the Women’s Forum for Peace. “Why doesn’t anyone speak about the abuses women have had to endure in the Northern Province”? This part of the country has suffered the brunt of the war. “For this reason, media have a great responsibility, namely do everything possible to protect human rights, equality and political freedom in order to build democracy,” she added. Between 2006 and 2009, 14 journalists and media workers have been murdered in Sri Lanka. Since the end of the civil war in 2009, the government has said that freedom of expression is guaranteed in the country.